The words “legislation” and “effective” are not often viewed as synonymous, especially between the political mules and elephants. Over the years, however, our national decision-makers have hit on a thing or two that really made a difference. One of these successes has had an impact on forage production in a large chunk of the East. It was enacted as the Clean Air Act of 1970; then came some significant amendments in 1990. As the name would imply, the Clean Air Act targeted air pollution at a number of levels, including automobiles and industry. One of the big environmental concerns at the time was acid rain, which was wreaking havoc on water and land resources. Acid rain is caused by emissions of sulfur dioxide and nitrogen oxides that react with water molecules in the atmosphere to produce acids. So what’s the relationship between the Clean Air Act, acid rain and forage production? Think sulfur. Sulfur is an essential plant nutrient. It’s not needed in the volumes that nitrogen, phosphorus and potassium are often used, but is required in greater amounts than micronutrients such as boron and manganese. Prior to 1990, significant quantities of sulfur were deposited on crop fields through rainfall. In much of the Eastern U.S., this amounted to about 20 pounds per acre per year (see figure). 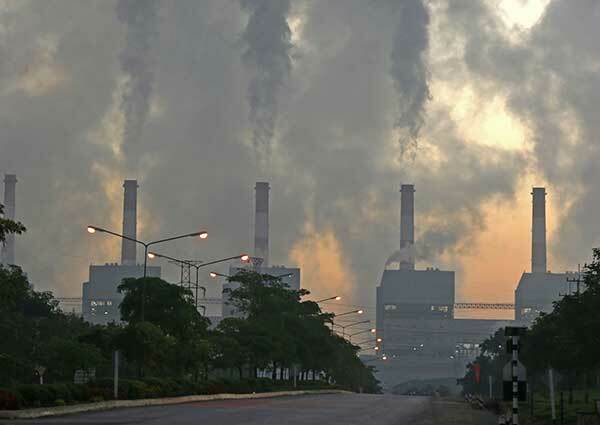 Amendments to the Clean Air Act in 1990 called for, among other things, a large reduction of sulfur pollutants through the use of industrial sulfur “scrubbers” and the burning of low sulfur coal in power plants. 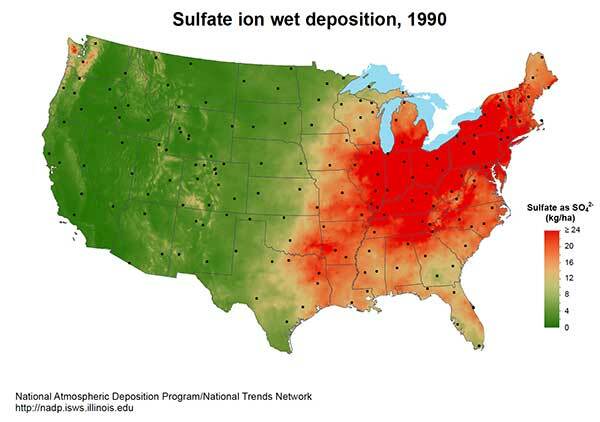 As we look at the present day situation, less than 10 pounds per acre of sulfur are deposited per year across much of the East. The ramifications for crop fertility programs are not fully known, but many state universities have noted an increase in sulfur deficiency symptoms, especially in alfalfa. Plant tissue analysis also confirms that sulfur deficiency is on the rise. Deficiency of sulfur in alfalfa is characterized by light green and stunted plants with thin stems and delayed maturity. For corn, a general chlorosis (yellowing) takes place, similar to nitrogen deficiency. Often plant leaf veins remain green. Sulfur, like nitrogen, is a mobile nutrient in the soil. This makes a standard soil test for sulfur somewhat less precise compared to those for phosphorus and potassium. Sources of sulfur not directly measured by the soil test may contribute significantly to crop requirements. In addition to precipitation, other plant sources of sulfur include organic matter, the subsoil and manure. Given sulfur’s mobility and its multiple sources, actual sulfur availability can vary from field to field and even within areas of fields; this is why many university specialists suggest using plant tissue analysis as the best method to confirm sufficiency. Two crops that require relatively large amounts of sulfur are alfalfa and corn harvested as silage. The increase of corn silage acres over the past 20 years and the increased yields obtained from both crops may also be contributing to less plant available sulfur. As we move forward through this decade, sulfur fertility will require more attention. If significant amounts of manure are applied to a field on a routine basis, sulfur likely won’t be an issue. However, in situations where little or no manure is applied or fields are low in organic matter, it’s likely sulfur will be deficient unless commercial sources are applied. 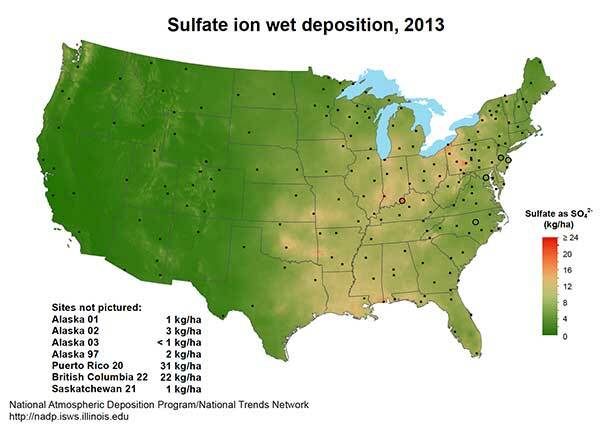 The days of relying on precipitation as a major sulfur nutrient source are over. The Clean Air Act is working.